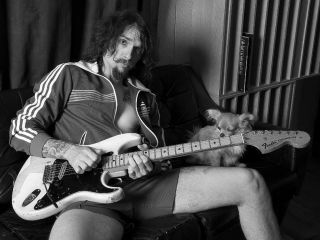 Moustachioed tiger-rider Justin Hawkins has revealed that The Darkness' third album could be released on 17 March next year. Speaking to Billboard, Justin revealed that the band are aiming for a March release and are nine songs in to the still-untitled collection, with a further two weeks of recording booked for January. The aforementioned release date of 17 March has special significance for Justin, as it's his birthday and, as he told the US mag, "that would be the ultimate gift to myself". TG's more interested in the sound of the record though, and fortunately the frontman's brother and rhythm guitarist, Dan Hawkins, found time to expand on that. "We're kind of trying to get back to the more organic kind of rock sounds of the Darkness," he told Billboard. "…I guess it's kind of following on from the first record rather than the second, which was kind of more about the production than the songs." We spoke to Justin about his plans for the new album back in August, check that out here: The Darkness talk new album. Here's the video for 'Growing On Me', because we'll basically use any excuse to post it.